The first modern Royal Mint gold proof sovereign was issued in 1979. The Royal Mint have issued a proof sovereign every year since. Since 1817, Benedetto Pistrucci’s famous portrayal of St. George and the dragon has primarily featured on the reverse of the gold sovereign, with the exception of a few dates. 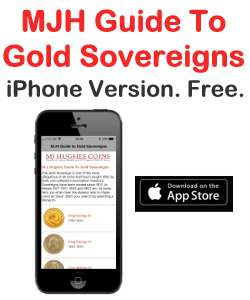 The design is extremely popular, and has become the symbol of a gold sovereign. Many people recognise a gold sovereign purely from the Pistrucci design. The Pistrucci St. George and the dragon portrayal features on all but four of the modern proof sovereigns – The 1989, 2002, 2005 and 2012 (Although the 2005 and 2012 do feature St. George, but different adaptations). Where the Royal Mint has been fairly consistent with the reverse designs used, they have not with the style of presentation boxes used. 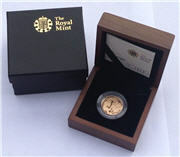 Over the past 33 years, the Royal Mint have changed the proof sovereign presentation boxes five times. The 1979 proof sovereign was issued in a blue spongy fold over case, with an outer blue card box. The 1980, 1981 and 1982 pieces were also issued in this style of case (Without the outer card boxes), subsequently of different colours. The 1980 came in a green case, the 1981 and light brown and the 1982 a black. It should be noted that the 1979 has been the only modern proof sovereign to be issued without a Certificate of Authenticity (COA). From 1983 to 1989, the Royal Mint issued proof sovereigns in a more prestigious case. A red leatherette box was used, with inlaid gold writing on the top reading – United Kingdom Proof Sovereign. A new box was used between 1990 to 1999. A maroon leatherette box, slightly larger than the previous red was chosen. The Royal Mint continued to use the inlaid gold wordage on the top of the box. The famous 1989 Tudor Rose 500th Anniversary proof sovereign was issued in both the red and maroon leatherette presentation cases. Many believe 1989 to be the changeover year, where the Royal Mint were using the last remaining red boxes, along with the new maroon cases. One big problem with the 1983 to 1989 red cases is that you tend to find the issued COA has ‘bite’ marks on the edge. This is where the catch on the box has caught the COA when closing. From 2000 to 2007, the style of box changed yet again. A small black velvet case, with a larger black card outer box was used. Inlaid gold writing on top of the outer box read – United Kingdom Gold Proof Sovereign. As a one off, the 2000 issue came in a box with writing that read – ‘2000 United Kingdom Gold Proof Sovereign’. Proof sovereigns issued from 2000 to 2007 came with larger COA’s, more like information booklets, matching quite well with the casing. In 2008, the Royal Mint bought out the ‘walnut’ case. A walnut style case, with an outer black card box. This presentation case has been used ever since, and is highly popular with collectors. 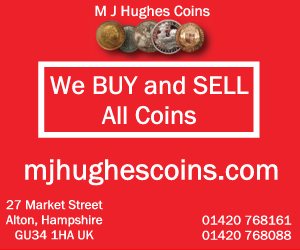 Max Hughes is a Professional Coin Dealer specialising in Gold Coins and Bullion and is a member of the BNTA. His website is mjhughescoins.com.